With all of the snow on the ground it’s hard to think of the autumn. But here we are, it’s autumn, in northern Germany. It’s 1705 and a young Johann Sebastian Bach has set out (many say by foot) on a nearly 250 mile journey to hear the composer, Buxtehude, in a series of concerts that were being held during the season of Advent, Abendmusik. So you’re probably wondering why a young teenager like Bach was willing to travel that far by foot to visit this composer who was at the end of his career? St. Mary's Church of Lübeck, was the last church where Dietrich Buxtehude had been positioned as cappelmeister, and the location where Bach was headed. This was the last stop for a long career in the music of the Lutheran church in the area. Buxtehude was born in 1637 in Helsingborg, Skåne. His first organ appointment was in his hometown. His father, Johannes, was the organist St. Olaf's church in Helsingør where Dietrich would eventually take over in 1660. 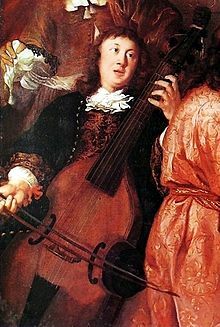 In 1668, he moved to Lübeck to join the blossoming music scene there. In Lübeck, he married, and had seven daughters by his wife Anna Margarethe who was the daughter of Franz Tunder the previous organist. Many of those children did not survive into adulthood. Though his legacy stood with Abendmusik, which stayed a tradition until 1810. Many of Buxtehude’s compositions only survive due to the work of his student’s transcriptions many of which did not stand the test of time. Of the 275 pieces that are catalogued and available, there are over 100 pieces of vocal music, and the second largest group is keyboard music. Many of these pieces have been regarded as major influences of composers like Bach, Brahms, and Handel. Enjoy this segment from his Pasacaglia in d minor.